Mark Walsh on Espoir D'Allen celebrates winning the Champions Hurdle last week. ESPOIR D’ALLEN, THE widest-margin winner of a Champion Hurdle when slamming his rivals by 15 lengths at Cheltenham last week, is finished for the season, trainer Gavin Cromwell has said. Cromwell had hinted Espoir D’Allen would not run again this season immediately after the Champion Hurdle and yesterday he confirmed he had drawn stumps with the five-year-old, who is the general 5-1 favourite to retain his crown next year. It may be over a week since Espoir D’Allen provided JP McManus with his eighth Champion Hurdle success and Cromwell with his greatest day so far in racing, but the trainer is still struggling to put the achievement into words. 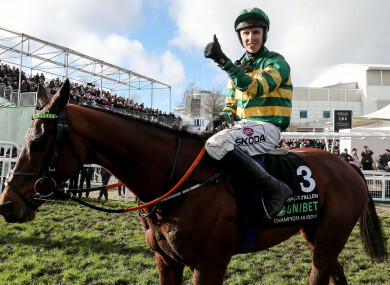 Email “Champion Hurdle hero Espoir D'Allen has 'done enough' for season”. Feedback on “Champion Hurdle hero Espoir D'Allen has 'done enough' for season”.